We’ll pull ‘em in the water! So if you were out cruising the beautiful, shallow, coral filled waters of the Keys and you heard a bump you may want to give us a call, especially if you notice any signs of vibration. We know you don’t want your props back on the boat on Keys’ time. 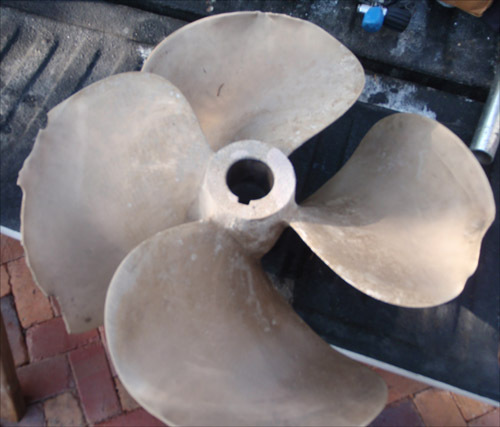 Our normal turn around time on a prop pull recondition is less than a week! In most cases we repair prop’s pitch angels to, or better than, factory standards. We have most pitch block sizes available. When metal is missing the props will be welded and props will always be balanced. 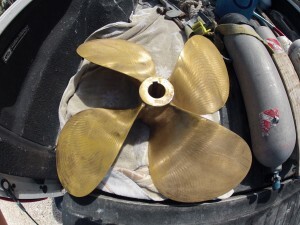 In the rare event that we are not able to repair a prop, we also sell new and used props. We can also straighten bent shafts. 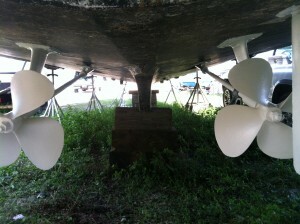 Props can be painted with Trilux, Velox or PropSpeed.